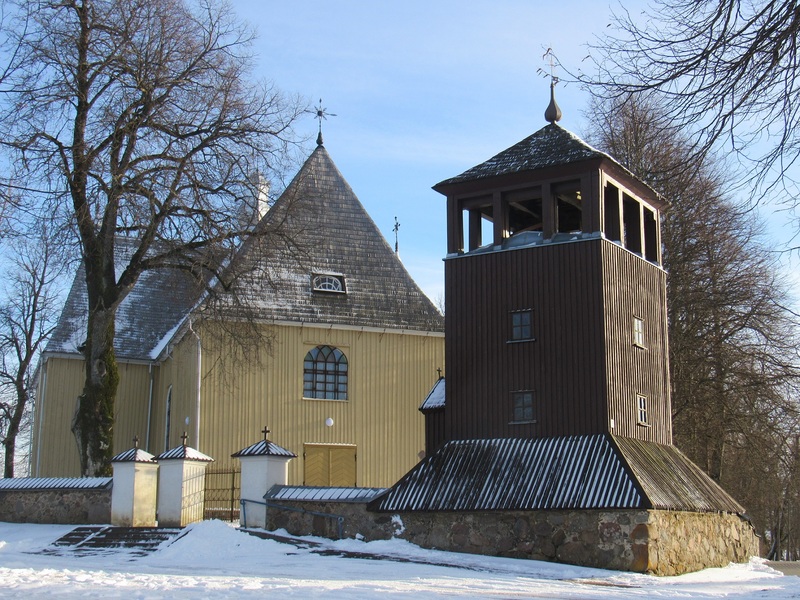 Saints Peter and Paul Church is one of the oldest wooden (from dressed logs) churches in Lithuania, built in 1744. 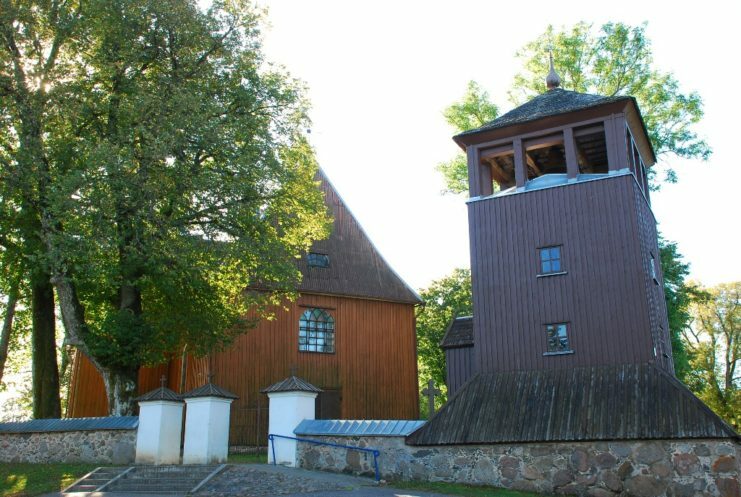 There is a wooden bell tower next to it from the 19th century. Many old paintings, liturgical clothes and accessories have survived here. Some of them are: a metal cup, a painting “St. Ann” from 18th century, a painting “The Holy Family” from 19th century and three upper clothes of the priest (called Chasuble) wearable during the Mass from the middle of 19th century, and the processional cross with the Crucifixion sculpture from 19th century – recognized as art monuments. One of the last owners of the Plateliai Manor, Marie Choiseul-Gouffier and her brother Gabriel Choiseul-Gouffier, were buried in the churchyard. Saints Peter and Paul’s Church has been renovated and refurbished many times, but its original appearance has not changed much until our times. Knowledge about the first wooden church of Plateliai has reached us from the 15th century. During the period of 1486-1526 it was built by Stanislovas Kęsgaila. The archaeological explorations of Šventorkalnis and the Round Hill of Plateliai indicate that the first church or chapel of Plateliai could stand on the Round Hill, rather than on the Šventorkalnis, as it was thought up to this day. It is believed that even earlier, around the 14th and 15th centuries, there was a place of sacrifice. After the baptism of Samogitia, Catholics set up their sanctuary in this place. During the archeological excavations, a large number of human bones were found on the Round Hill. This shows that there were also cemeteries here long ago. According to page 96 of XXIII volume of the Lithuanian Encyclopedia, King Sigismund Augustus had the right of the patron of the Plateliai church, which he sometimes handed over to Plungė’s holders. The king had made the condition that the contenders to the pastor of the Plateliai church should be Lithuanians or, at least, be capable to speak Lithuanian language. The beginning of 18th century has not been easy for the Plateliai town. At the beginning of the century, Plateliai were severely affected by the war and from a high fire in 1729. Young and active pastor Juozapas Vaitkevičius was appointed to work in Plateliai in 1741. For his merits to the Catholic Church, the Pope has granted him few honorary titles. The pastor with help of other parishioners built a new, fourth church in Plateliai in 1744, which still exists today. 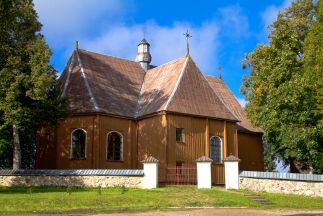 The Plateliai church is often compared with the wooden Beržoras church which is nearby. 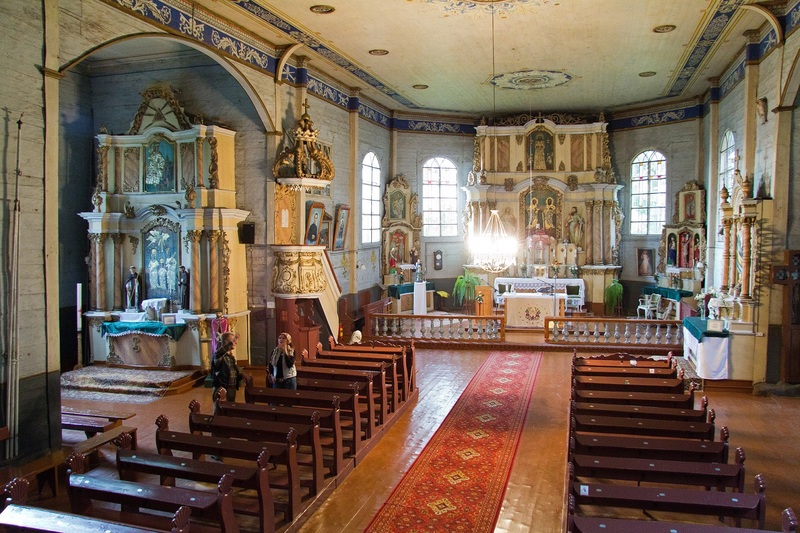 They are associated not only with the same pastor, with whose initiative a branch of the Plateliai church in Beržoras was built in 1746, but also because both of them it is believed are built by the same masters and are almost of the same age and the same cross-sectional plan. The deceased builder of Plateliai wooden church J. Vaitkevičius was buried in its basement, under the altar of St. Joseph in 1776. The interior of the Plateliai sanctuary is decorated with the high one and four collateral baroque style altars. They are decorated with pillars, carvings and paintings with silver linings. All the altars were painted in white and gold-plated in 18th century. There was also a colored and ornate with salient rococo ornaments decorated pulpit with openwork tester, crowned with a crown. In the left chapel there is a rococo baptistery with a dome in which the Holy Water and baptismal oils are kept. Above it, there is a big painting of St. John the Baptist. The baptistery has survived since the church was built. Paintings with the garnitures indicate that they are miraculous, offering the grace. The expensive garnitures of paintings are a sign that such church could be rich. At the back of the nave there is an organ choir with a top arcade and ancient loges of chanters at the bottom. This choir had an organ of 10 voices, a big drum and loud-voiced jingles in 18th century. The present organ was installed in 1909 and made by the famous master Jonas Garalevičius. The children of some of the former owners of the Plateliai Manor are resting in the churchyard: the Count Maria Choiseul and her brother Gabriel, who was the owner of the Papilys Manor. Near the Plateliai church there is a parsonage, built in 1903. The churchyard has a bell-tower built in 1905, with two hanging bells. One of them tells us stories about the year 1648. The second one is from 1928 and weighs 321 kg. There were two more bells here, but they were requisitioned by the Germans in 1917. – That they could not carry you!